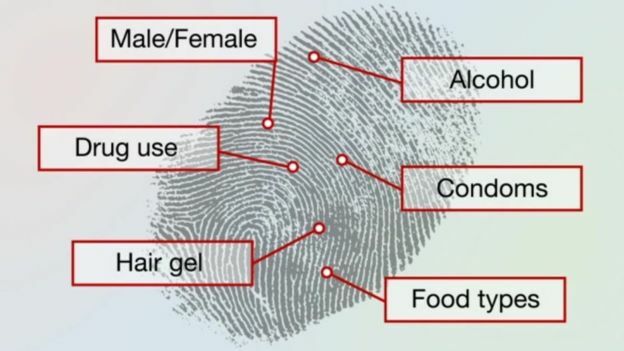 Fingerprint spectrometry analysis – a technology which can detect the brand of hair gel or condom used by a suspect – could soon be admissible as evidence in UK courts. Sheffield University scientists have been working with British Police in the first forensic trial of its kind. The technique uses time-of-flight mass spectrometry (TOFMS) to detect small traces of various substances within a fingermark. As it turns out, a fingerprint reveals much more than a person’s identity. It can provide a range of information about a suspect, including any alcohol or drug use. The Home Office said it could be “only months” before it is used in casework. The main components of fingermarks are water, amino acids, salts and fatty acids. Nothing other than sweat. Sweat is a biological matrix. It contains molecules from within your body, and molecules that you have just contaminated your fingertips with. The amount of information that can be potentially retrieved is huge. And researchers from Sheffield Hallam University have been working with West Yorkshire Police to test the technology since 2012. In a 2015 study, 17 compounds were selected from 5 different classes of drug: amphetamines, alkaloids, opioids, cannabinoids and designer drugs. Both parent drugs and metabolites, they included methamphetamine and 4-methylamphetamine isomers. Mapping such “story telling” substances directly onto the identifying fingerprint ridges will potentially generate circumstantial, associative or even corroborative evidence on the suspect’s lifestyle and activities, allowing more informed criminal investigations and judicial debates. Detecting drug metabolites would indicate drug “abuse” rather than “handling”, which pertain to two very different forensic scenarios. The standard test for latent marks on a porous substrate involves exposure to a solution of ninhydrin (2,2-dihydroxyindane-1,3-dione) which reacts with the terminal amines of lysine residues within the sweat to create a purple product. For non-porous substrates, the most popular method is to fume the sample with cyanoacrylate – plain old Super Glue vapour to you and me. For some reason, the chemical polymerises when it comes into contact with the fingermark, making it visible. However, these methods do not always work. It works by vaporising the sample. From illegal substance abuse to ingested coffee, the researchers can detect a broad range of molecules, including drugs and caffeine. We can now understand whether or not a person has dealt drugs or actually taken drugs. And we can detect ingested substances. So we may be able to reconstruct what the perpetrator was eating before committing the crime! The power of the method has been neatly illustrated with a study on condom lubricants. In many cases of sexual assault, the perpetrator uses a condom to avoid leaving DNA evidence. Experiments were carried out looking at condom lubricant residues in fingermarks. The method can detect a variety of lubricants, such as PDM (polydimethylsiloxane) and PE (polyethylene glycol). Different brands of condoms have different lubricant profiles, so the technique could be used to identify a particular brand of condom that was used,’ says Francese. The team has been refining the technique and protocols for use in forensic laboratories, and have been working with West Yorkshire Police to pilot the technique. What can you tell from a Fingerprint using TOFMS Analysis? Whether they have taken drugs: cocaine, THC – the chemical in marijuana and cannabis, heroin, amphetamine and other drugs can be detected. Acting director of the Yorkshire and Humber Regional Scientific Support at West Yorkshire Police, Neil Denison said: “We’re very, very keen to keep up with criminals quite frankly, and this is one way that we can do that. The Home Office has invested £80,000 in the project, with senior technical specialist Stephen Bleay writing a blueprint for all police forces in the UK to use. Suspect profiling is no longer based on behavioural science but complements this discipline and the investigations by detecting and visualising the molecular make-up of fingermarks onto the identifying ridges. This forensic technique provides the link between the biometric information – fingermark ridge pattern -and the corpus delicti – intelligence on the circumstances of the crime. Project leader Dr Simona Francese said the technology had been used to detect blood in a 30-year-old print: “It’s very sophisticated, it’s expensive but it’s worthwhile,” she added. The technique could be used in high-profile cold case reviews.